One of the best places to stay in Estes Park, CO! Stay in the original Stanley Hotel featuring historic hotel rooms offering a unique experience and classically styled furnishings. Classic rooms are located within the main building of The Stanley Hotel. 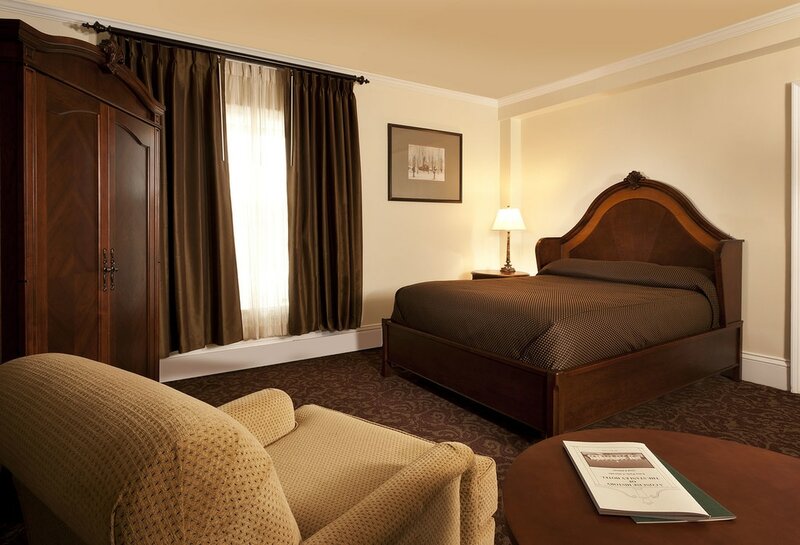 Each room includes a comfortable queen bed, king bed or two queen beds; free Wi-Fi & 42” LG flat screen televisions! Experience the history of The Stanley Hotel! All the Deluxe rooms are located in the main building of the Stanley Hotel. The Deluxe King Rooms are more spacious rooms that include a comfortable king bed with custom, hand-made bedding; a Jacuzzi tub; free Wi-Fi; & 42” LG flat screen televisions! Experience the history of The Stanley Hotel! All the Superior King rooms are located in the main building of the Stanley Hotel. The Superior King Rooms are more spacious rooms that include a comfortable king bed with custom, hand-made bedding; a great view of the surrounding Rocky Mountains, a Jacuzzi tub, free Wi-Fi, & 42” LG flat screen televisions! Several suite setups are available including junior suites, full suites, family suites, and the Heritage Suite. Suites offer a one or two bed setup with a separate living room. A full sleeper sofa in the living room is great for small families, or for couples looking for some extra space to enjoy the historic ambiance of our rooms. Stanley Hotel features a variety of rooms with high paranormal activity including the famous Stephen King Suite 217, the Ghost Hunters' favorite room 401, as well as 407, and 428. These are among our most-requested rooms, availability is limited. The Presidential Cottage features three bedrooms and two and a half baths on the main and upper level (each with a king size bed), as well as a kitchenette, a dining and living room area, and a private deck off the living room and master bedroom. In addition, two garden-level units can be opened to the main cottage, each with their own king bed and bathroom. Sold together, the Presidential Cottage features five bedrooms and four-and a half bathrooms. The Presidential Cottage is air-conditioned. Contemporary rooms and apartment-like suites with air conditioning, full kitchens, 50" SMART HDTV, and high-speed WiFi. Quietly located off the main hotel. The Lodge offers an boutique hotel experience with historic rooms similar to the original hotel. Complementary coffee and wine hour reception. Reserve one of our fully equipped private condo residences for your upcoming group getaway. The perfect choice for your Estes Park vacation rental.